Your little back seat driver is going to love having their own steering wheel – no drivers ed classes needed! (at least not yet!) B. Toys’ latest educational toy for children is the ultra cool YouTurns, a steering wheel that doubles as a pillow for long car rides. Just flip it over, and little ones can nod off on the way to Grandma’s. 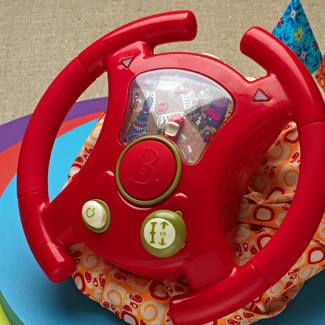 The bright red wheel sits neatly in your child’s lap, and can be steered left or right with real engine and horn sounds. Plus, tiny tots will love that they can shift into forward, reverse or neutral as they cruise along, and the screen even lights up for night driving! With LED blinkers and a music button that plays lively tunes, YouTurns will spark your child’s imagination while beating the backseat blues. Another great use for YouTurns? It makes an excellent gift for children who have an extended stay in the hospital. It can be used for playing or sleeping while confined to a hospital bed, and is much more exciting than a teddy bear! To learn more about YouTurns, or other B. Toys, visit justb-byou.com. B Toys can be found at any local Target store, as well.